Kia has stepped up the value equation for its award-winning Sorento SUV with a stylish Family Pack that adds $3400 in value at no additional cost. (SEOUL) July 29, 2014 - The all-new third generation Kia Sorento will be unveiled in Korea next month, featuring bold, swept-back exterior styling. For the second year in a row Kia's facelifted Sorento has swept aside all opposition to take top honours for the Best SUV Over $40,000 in Drive's annual Car Of The Year awards. Kia Motors Australia has developed a heavy duty towing solution to give owners of the award-winning facelifted Sorento even greater opportunity to get the best from the best. 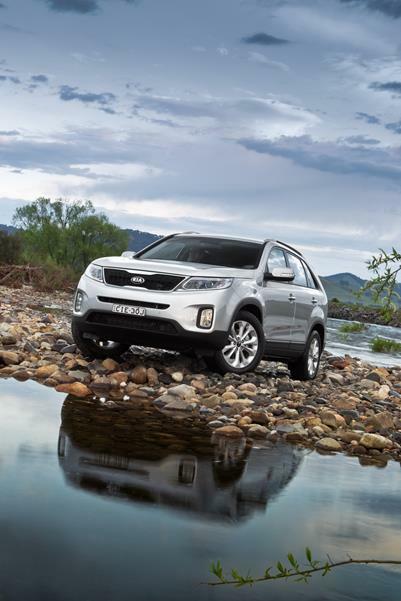 Kia's facelifted Sorento has swept aside a stellar field to take top honours in Drive's annual Car Of The Year awards. Kia's Sorento train just keeps on rolling with the addition of the Global Circuit Limited Edition lifting the award-winning SUV's value equation to even loftier heights. Kia's medium sized SUV, Sorento, has received a 2011 model year refresh across the range with a long list of enhancements ranging from Bluetooth technology to leather wrapped instrument cluster housing. Multiple Australia Surf Iron Man Champion Guy Leech received a brand new Kia Sorento Si last week and put the 4WD straight to work during a multi sport event in Forster NSW.